DAYTON, Ohio — Dr. Randy Marriott clicked open the daily report he gets on drug overdoses in the county. Only one in the last 24 hours — stunningly low compared with the long lists he used to scroll through last year in a grim morning routine. “They just began to abruptly drop off,” said Marriott, who oversees the handoff of patients from local rescue squads to Premier Health, the region’s biggest hospital system. Overdose deaths in Montgomery County, anchored by Dayton, have plunged this year, after a stretch so bad that the coroner’s office kept running out of space and having to rent refrigerated trailers. The county had 548 overdose deaths by Nov. 30 last year; this year there have been 250, a 54 percent decline. Dayton, a hollowed-out manufacturing center at the juncture of two major interstates, had one of the highest opioid overdose death rates in the nation in 2017 and the worst in Ohio. Now, it may be at the leading edge of a waning phase of an epidemic that has killed hundreds of thousands of people in the United States over the past decade, including nearly 50,000 last year. For the first time in years, the number of opioid deaths nationwide has begun to dip, according to preliminary data from the Centers for Disease Control and Prevention (CDC) — with totals for the preceding 12 months falling slightly but steadily between December 2017 and April 2018. The flattening curve — along with declining opioid prescription rates and survey data suggesting far fewer Americans tried heroin last year and more got addiction treatment — is the first encouraging news in a while. While it’s too soon to know if the improvement is part of a long-term trend, it is clear there are some lessons to be learned from Dayton. The New York Times spent several days here interviewing police and public-health officials; doctors, nurses and other treatment providers; people recovering from opioid addiction and people who are still using heroin and other drugs. Mayor Nan Whaley thinks nothing has had as big an impact on overdose deaths as Gov. John Kasich’s decision to expand Medicaid in 2015, a move that gave nearly 700,000 low-income adults access to free addiction and mental-health treatment. In Dayton, that’s drawn more than a dozen new treatment providers in the past year alone, including residential programs and outpatient clinics that dispense methadone, buprenorphine and naltrexone, the three medications approved by the U.S. Food and Drug Administration (FDA) to treat opioid addiction. Kasich has said the state is spending $1 billion a year to address the opioid epidemic, and a big chunk of that is Medicaid funds. With Medicaid now paying for nearly all low-income residents who need it to get addiction treatment, Ohio has been able to go beyond the basics in spending its share of several billion dollars in the opioid grant money the Trump administration has been giving to states. One example: paying for people who go to jail and lose their Medicaid coverage to stay in treatment with their regular provider while they’re incarcerated. It’s entirely possible that the biggest factor in Dayton has been the dwindling presence on the streets of carfentanil — an analog of the synthetic opioid fentanyl that the CDC describes as 10,000 times more powerful than morphine. Ohio was particularly hammered by carfentanil in recent years; according to the CDC, the state had 1,106 carfentanil-related deaths from July 2016 through June 2017, compared with only 130 in nine other hard-hit states combined. During that period, carfentanil was showing up regularly in Dayton’s street drugs, including methamphetamine, cocaine and fentanyl. Nobody has figured out why Ohio saw more of it than anywhere else, but there’s no question it played a huge role in the explosion of deaths in Dayton early this past year. The news is not all good. Cocaine and particularly meth use is rising fast in the Dayton area, as it is nationwide. And they’re often mixed with fentanyl; 77 percent of the overdose deaths in Montgomery County from January through April involved fentanyl, roughly the same as during the same period last year. The national data also suggest overdoses involving fentanyl continue to rise, along with those involving cocaine and meth, while deaths involving heroin and prescription drugs are falling slightly. 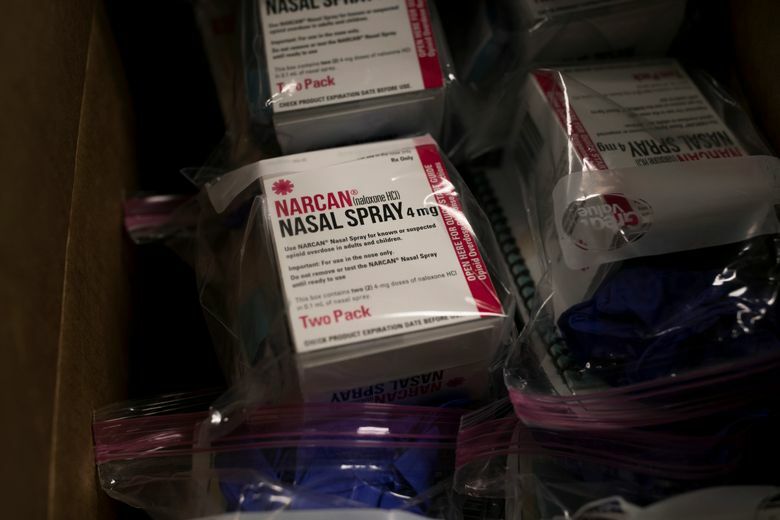 By now, most Americans have heard of naloxone — also known by the brand name Narcan — the medication that reverses opioid overdoses if administered quickly enough, by injection or nasal spray. But few Americans cities have blanketed their neighborhoods with naloxone like Dayton has. Montgomery County agencies distributed 3,300 naloxone kits last year and are on course to more than double that number this year, holding trainings at treatment centers and 12-step meetings as well as at local businesses and schools. Starting in 2014, Richard Biehl, the Dayton police chief, directed all his officers to carry naloxone — going against some of his peers in other Ohio cities, including a sheriff in a neighboring county who outright refused to equip his deputies with it. Some in Ohio and elsewhere continue to oppose harm-reduction tools like naloxone, saying they enable drug use, but the evidence is overwhelming that they save lives. “We really jumped on it because we saw it as absolutely consistent with our public mission to save lives,” Biehl said. Research suggests he was right. A recent study from Stanford University estimated that wider availability of naloxone could prevent 21,000 deaths over the next decade — more than expanding access to medications for addiction or reducing painkiller prescriptions could. 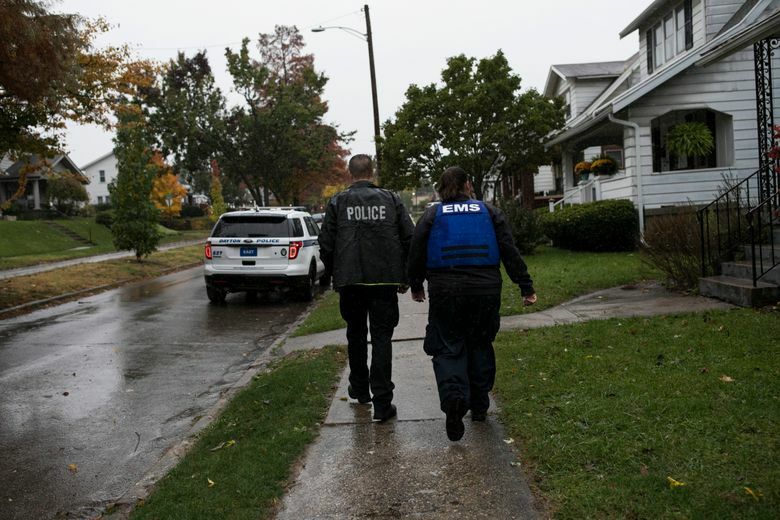 But as fentanyl analogues — whose chemical structure is slightly different and can be more lethal — started entering the drug supply in Dayton, it became harder to revive overdose victims with the standard dose of naloxone. So the city, with state support, has spent a lot more to provide higher doses — $350,000 this past year. Even though there are many more treatment options here now, that doesn’t mean people stay in treatment as long as they should. 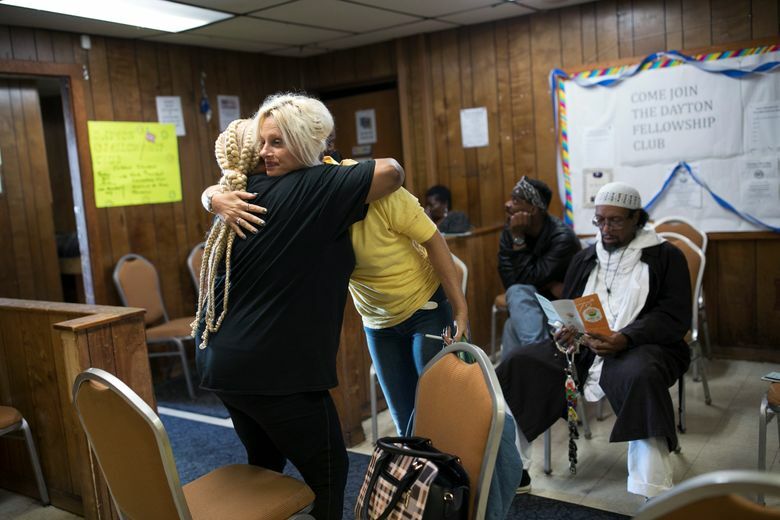 But the city has an unusually large network of recovery support groups, including neighborhood clubs that provide space for Narcotics Anonymous meetings to Erion’s group, which has thousands of members in Montgomery and four surrounding counties. One example is an initiative called GROW — Getting Recovery Options Working — that dispatches teams of social workers, medics, police officers and people in recovery to homes of people who have recently overdosed. The teams offer to help them get into treatment and to drive them to a program. They also supply them and their families with naloxone to have on hand in case it’s needed. Joshua Lewis, 37, is among those who have managed to stay alive long enough to benefit from recovery supports. He overdosed repeatedly this past year on heroin and fentanyl, while also using meth. His girlfriend found him a bed at a local treatment center, after which he spent three months at Joshua Recovery Ministries, a religious program that provides housing for men recovering from addiction. He learned how to read there, he said, and is now training to become a peer supporter. He doesn’t use medications for addiction but said he would not discourage others. When Sam Quinones, author of “Dreamland: The True Tale of America’s Opiate Epidemic,” testified before Congress earlier this year, he said that “the more cops and public-health nurses go out for a beer, bridge that cultural chasm between them,” the better chance the country had at solving the problem. Dayton has largely succeeded at bridging that chasm, which too often pits a punitive, abstinence-only approach to addiction against one that seeks to reduce deaths by any means possible. Law-enforcement and public-health representatives work hand in hand on a two-year-old Community Overdose Action Team, sharing data and strategizing with dozens of local organizations. Biehl was fully supportive of the city’s decision to set up a syringe exchange in 2014. Research has consistently found that such programs, which allow people who inject drugs to trade dirty needles for clean ones, prevent deaths related to infections like HIV, hepatitis C and endocarditis. While other cities, including Charleston, West Virginia, and Santa Ana, California, closed their needle exchanges this year because of opposition, including from the police, Dayton’s program continues to operate at two sites, each open once a week. The needle exchanges also help clients sign up for Medicaid and connect them with addiction treatment.